The beautiful colors in fireworks – so good at stirring our emotions – are pure chemistry. Canada Day was Saturday, July 1, 2018, and Wednesday, July 4, is Independence Day – usually called Fourth of July – in the U.S. So it’s fireworks season in North America, and red, orange, yellow, green, blue and purple colors are exploding into our night skies. The colors in fireworks help create “ohhhhs” and “ahhhhs.” But what creates the colors? The answer is: pure chemistry. The colors in fireworks are created by the use of metal salts. 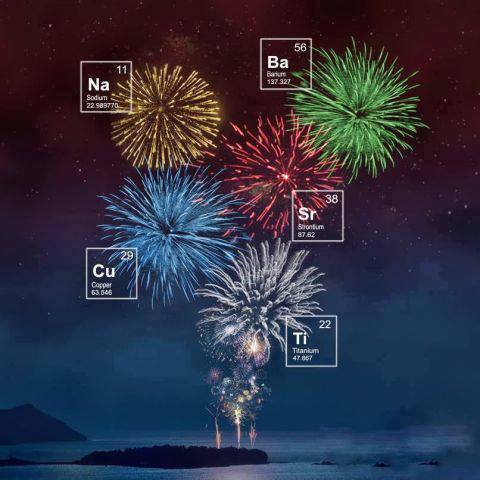 Metal salts commonly used in firework displays include: strontium carbonate (red fireworks), calcium chloride (orange fireworks), sodium nitrate (yellow fireworks), barium chloride (green fireworks) and copper chloride (blue fireworks). Purple fireworks are typically produced by use of a mixture of strontium (red) and copper (blue) compounds. After a firework is ignited, a lift charge propels it into the sky. That’s just explosive black powder in a confined space that, when lit, causes a fast increase of heat and gas that can send a firework as high as 1,000 feet (300 meters) into the air. Meanwhile, a time-delay fuse burns slowly into the interior of the firework shell. After about 5 seconds, as the shell is soaring overhead, the fuse kindles a charge that reaches the core of the firework, explodes and ignites the stars that contain the metal salts. Voila! A beautiful and colorful fireworks display. By the way, the people who create fireworks are precise craftsmen. 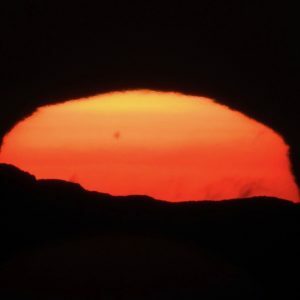 It’s a complex process, and even one thing being off — too much black powder, stars that aren’t aligned correctly or a trigger that fires too soon or too late — can cause everything else to go wrong. 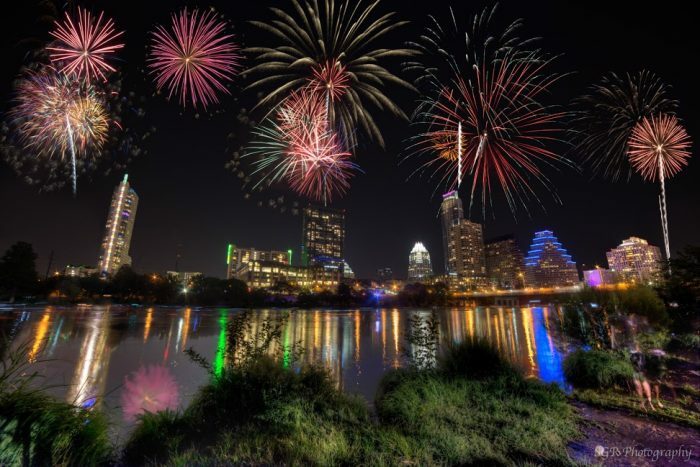 Austin, Texas, fireworks on July 4, 2013. Photo by our friend Sergio Garcia Rill. Bottom line: The red, orange, yellow, green, blue and purple colors exploding in the night sky during a pyrotechnic festival are created by the use of metal salts.